Gazing out from the justly famous wilderness viewpoint at Kanangra Walls, it is well to ponder what might have been, and the tumultuous story of how the wilderness came to be saved. Beyond the staggering chasm of Kanangra Deep and the sweeping conglomerate cliff, you can just see a corner of Lake Burragorang. From nearby points on Kanangra Plateau, if you know where to look, you can make out the inconsequential bump of Mount Armour, and more starkly, the glass towers of Sydney - not so far away as might be thought, neither in distance nor in influence. Kanangra-Boyd National Park has been pivotal in the history of conservation in Australia. The park had its genesis in a 1937 reserve centred on Kanangra Creek, but then emerged from a political struggle involving the New South Wales Government, conservation campaigners, and water supply, mining and forestry interests. Key events in the saga were the reservation of Colong Caves in 1899, construction of a tourist road along the old track from Jenolan Caves to Kanangra Walls in 1940, completion of Warragamba Dam in 1960, which prompted the establishment of a large protected catchment area, a pre-emptive 1961 claim by conservationists for a national park over the 1937 reserve, and a proposal that emerged in 1963 to quarry limestone from Mount Armour, in the historic Colong Caves Reserve. The catchment declaration effectively protected the vast bushland of the southern Blue Mountains, but conservationists preferred their national park. Things came to a head with the mining proposal, which would violate a reserve and chew the heart out of the wilderness, regardless of the catchment protection. This was a time of emerging environmental concern in the community, and conservation groups were able to mount a vigorous campaign of publicising, lobbying and demonstrating. They invaded corporate boardrooms by buying shares in the cement company. In 1969 a Kanangra-Boyd National Park was declared, omitting the mining lease. The government was determined that mining would go ahead, but eventually buckled to public pressure. In 1974 the lease was added to the park (and the miners moved to Marulan). Meanwhile, the Forestry Commission was planning to clear the native montane forests of the Boyd Plateau and plant exotic pine plantations. Ponder this, on your drive across the plateau to Kanangra Walls. After the Colong win, environment groups turned their attention to securing protection for the subalpine plateau in 1970. By 1974 they had forced a public enquiry by a new creature on the Australian landscape, the State Pollution Control Commission. The enquiry found that conservation was a higher use than pine trees, and the Boyd was added to the park in 1977. It was one of the first signs that the community was moving towards placing limits on the exploitation of native forests, and a harbinger of later disputes over rainforest, woodchipping and wild forest logging. Also in 1977, the NSW Government added a massive area of the Warragamba Catchment, almost surrounding Kanangra-Boyd, to Blue Mountains National Park. How far official attitudes had moved, in just a decade. 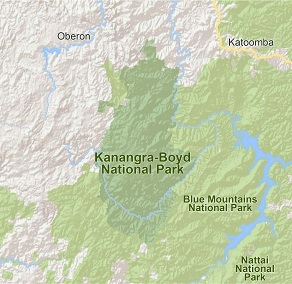 Today, Kanangra-Boyd National Park takes in over 68,000 hectares. The Kanangra-Boyd Wilderness – the second largest wilderness in NSW, next to Wollemi - was finally declared in 1997, and covers 111,000 hectares of Kanangra-Boyd and Blue Mountains national parks. The Boyd Plateau is slowly recovering from logging, and is the highest land in the World Heritage Area. The metamorphic and igneous rocks, steep ravines and wild rivers of Kanangra-Boyd are a contrast to the sandstone that dominates much of the World Heritage Area, and a magnet for self-reliant, multi-day bushwalkers. The walking is less scrubby and cliff-bound, but relief reaches over 1000 metres where the Boyd Plateau falls towards the Coxs River. For less adventurous folk, the track out onto Kanangra Plateau is one of the most spectacular easy walks to be had anywhere. Delightful car-camping can be enjoyed on the banks of the Boyd River, beneath graceful gums that might have been cleared for pines. 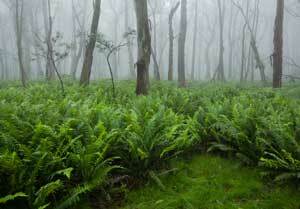 Moist montane forest, Boyd Plateau. All this could have been gone, if people had not stood against the clearing of the Boyd forests for a pine plantation in the 1970s. Stumps can still be seen from the long years of selective logging that ended in 1977, but the plateau supports a variety of appealing wet and dry forests on various rock types and soils, including some volcanic basalt. Most of the plateau lies between 1100 metres and 1300 metres elevation, with Snow Gums on the high granite and Mountain Gums, Peppermints, Ribbon Gums and many other eucalypts. Snow grass often creates a lush carpet at ground level, as in this scene, with a dense but patchy understorey of ferns. 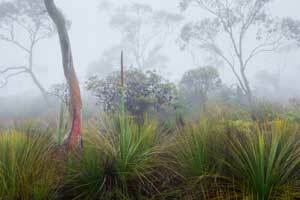 Misty heath with grasstrees and Brittle Gums, Kanangra Tops. Kanangra Walls and the adjacent plateau tops on the edge of the Boyd Plateau are composed of Permian age conglomerate, at the very bottom of the Sydney Basin sediments and overlying the Lachlan Fold Belt rocks. Vegetation on the shallow, infertile and often waterlogged soils is mostly heath and sedgeland - intricate, species-rich and beautiful communities that allow expansive views over magnificent wilderness. 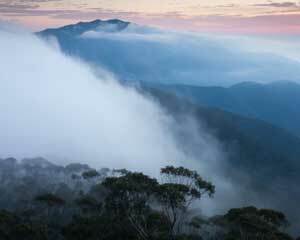 Mount Cloudmaker breaks through morning fog on the Gangerang Range. The steep ridge and ravine terrain of Kanangra-Boyd National Park is formed in a different geology to the typical sandstone plateaus, clifflines and gorges of the main Blue Mountains area to the north. Here, metamorphosed and folded sedimentary rocks of the Lachlan Fold Belt dominate - as they do through the Central Tablelands. 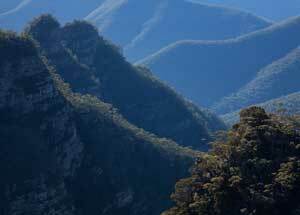 The Gangerang Range extends north-east from the Boyd Plateau to divide the Kowmung and Coxs Rivers, and is a centrepiece of the Kanangra-Boyd Wilderness, the second largest declared wilderness in NSW (after Wollemi). Tilted strata of Thurat Spires and Kanangra Deep form a classic blue-ridge landscape of the southern Blue Mountains. In this area, resistant quartzite (sandstone hardened by heat and pressure) creates some of the most dramatic terrain in the whole World Heritage Area. This is part of the Great Escarpment, which is recognised as running along the length of Australia's eastern seaboard and is related to ancient shifting of the continents. Local relief exceeds 1000 metres where the Boyd Plateau - an eastward extension of the Central Tablelands - falls down the escarpment towards the Coxs River. 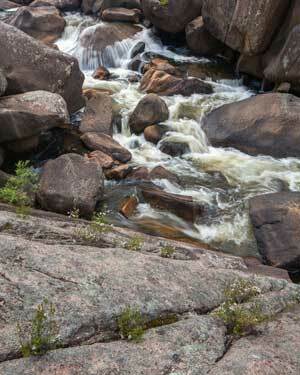 The Kowmung River churns through a long granite gorge in Morong Deep. In places, younger granites have pushed up from below into the Lachlan Fold Belt. 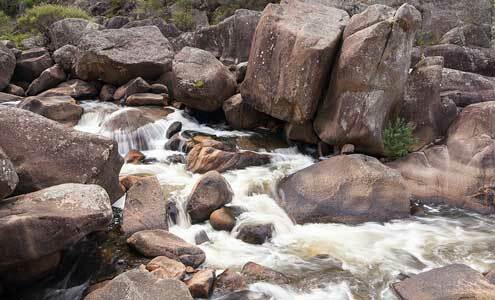 One such batholith takes in part of Boyd Plateau and the upper valley of the Kowmung, creating a typically granitic landscape of rounded tors and slabby waterfalls and adding to the diversity of Kanangra-Boyd National Park. The Kowmung is wild for all but its very headwaters (which rise in grazing land), and one of the largest streams in NSW that has not been dammed. It's an important source of clean water for Lake Burragorang.